First off, I'd like to let you know that I listened to this book on Audio CD. I tell you this since I feel it may be different to experience books this way than actually reading them but it is a good way to get through the long hours of a road trip. Anyway, here's some of my thoughts as I listened to this book. For me, this book didn't seem to be character driven since I didn't feel a huge connection to any of the characters although I didn't dislike them either. Actually, the storyline was interesting enough to sustain the desire to continue listening to the book. I wanted to find out what would happen next but at the same time I was not compelled with the main character. I enjoyed only one of the side characters namely the coach for the Parma Panthers. All others only seemed necessary to guide the book along. Basically, this novel showcases Rick Dockery, a career third string NFL quarterback. Right away, the disappointment sets in for Rick after a game injury lands him in a hospital bed. His career seemed to have a very promising start, but all kinds of unfortunate mishaps including concussions & constant trades kept upsetting his dreams. After all, it can't be much worse than considering he just played the worst game of his career which gave him yet another concussion on his short-lived stint for the Cleveland Browns. Not only that Rick is ridiculed, targeted and credited for the loss that completely derailed playoff hopes for the franchise. Now, he's left with his hopes dashed and pondering if he'd ever play in the NFL again, his agent out of options, suggests a little known Italian league and an escape from his many escalated troubles. After much protest because it means giving up what he'd always wanted, Rick agrees and soon he is on his way to play for the Panthers in Parma, Italy of all places. Here in the backdrop of Italy is the overlaying sense of the story all described in terms of football and food. It is a simplistic read which provides an elusion that the reader might find enjoyable. For my final analysis, this book isn't for everyone and it is not one of my favorites of Grisham although it is not completely uninteresting. Kewl review, Julie. i read this back in 2008 and gave it a "C". 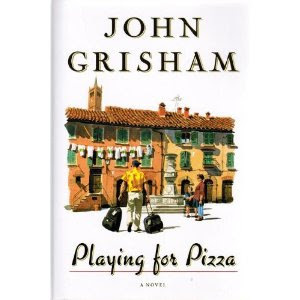 i agree with you - it isn't bad, but no one will ever call this Grisham's finest moment. Must be an enjoyable read Playing for Pizza by John Grisham. loved the way you wrote it. I find your review very genuine and orignal, this book is going in by "to read" list.